Can you hear that faint thumping? The one that syncs with your heart when you lie quietly in bed after the kids are finally asleep after B-B-B (Bath-Book-Bed)? That is the sound of motivated, unsung teams of hero-advocate superparents and medical professionals banging on a glass ceiling for all of us. Theirs is a reality that most people don’t even know exists, although it unexpectedly crashes into the lives of 1 in 2,000 to 1 in 250,000 Americans. I don’t say this to scare you, but to shine the light on a fierce, under-the-radar campaign being waged to help everyone have healthier kids by adding key genetic conditions to the recommended uniform screening panel (RUSP) for U.S. newborn screening testing programs. To understand the importance of this fight, you may need a little background that comes with hefty abbreviations (sorry… that’s science and government for you). Did you know that ALL babies in the United States have newborn screening testing done on a small amount of blood taken from their heel in the first days of their lives to see if they have a life-impacting genetic condition? Unless their parents specifically decline the test, a Band-Aid appears on a newborn’s heel like a flag, signaling the testing is done. News to you? Nurses tell parents before the testing it is being done, but that information can get lost in the usual joy (and exhaustion) of having a new baby. Despite its low profile, the answers doctors get from newborn screening can make the difference between life and death for a baby and allow for life-changing early treatment of genetic conditions. Sounds important for a test many parents don’t even know exist, doesn’t it? Grifynn Fraser Ward-Guthrie, great-grandson of Dr. Robert and Margaret Guthrie, receiving the Guthrie Test in 2014. Photo courtesy of http://www.robertguthriepku.org. Most newborn screening results are normal. If they are, other than a note in the baby’s chart, parents may never hear about the test again. However, some families hear unexpected and scary news about their new babies that changes their entire lives. Newborn screening began in the U.S. with the amazing Dr. Robert Guthrie, AKA “The Father of Newborn Screening” who was himself a parent, hero-advocate and scientist rolled all into one. Well before the RUSP for newborn screening was a twinkle in our eyes and spurred on by personal and family experiences, Dr. Guthrie figured out how to test for one common genetic and life-impacting genetic disorder, phenylketonuria (or PKU). He knew PKU could be treated in infancy with a special diet and advocated for all babies to be tested for it as a brand-new public health initiative. Incredible! Let’s fast-forward to the 2000s, when we can effectively do newborn screening for many more genetic conditions than PKU. In fact, we could test dried blood spots for hundreds of genetic conditions. 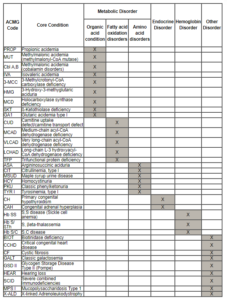 What genetic conditions did your baby get screened for as a newborn? Interestingly, that depends on the date your baby was born and (if you’re in the U.S.) the state in which your baby was officially delivered and spent the first days of life. 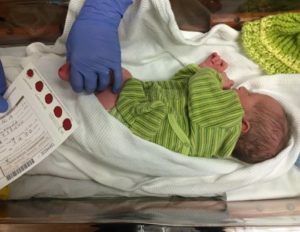 The number of genetic conditions tested for on each newborn dried blood spot is different from state to state, because each state decides which conditions to add to their newborn screen. Currently, the number of diseases by each state ranges from 39 to well over 50 genetic conditions. That means that if you had a baby in Utah last year, your newborn would have been screened for different conditions than if you lived in New York. In order to help states prioritize the conditions to add to their newborn screening test, a group of experts were gathered to on a committee, fabulously and simply named the Secretary’s Advisory Committee on Heritable Disorders in Newborns and Children (or SACHDNC, for short). Along with the Secretary of the U.S. Department of Health and Human Services, they put together a RUSP for every state; it currently has 34 main condition recommendations. The states don’t have to follow the recommendation, but it puts pressure on them to add the RUSP conditions. Why? Because the SACHDNC thoroughly reviews the scientific evidence on conditions and tries to add only those that meet key hurdles, like: has accurate testing that can be done on a dried blood spot, has proof that it would make a difference if it is found early, and has an effective treatment. Those are high hurdles to meet for a rare genetic condition, even if there are motivated family members and interested scientific experts. It can feel like being trapped beneath a thick, shatterproof glass ceiling trying to break through. One poignant example is the team of advocates, parents, and scientists, working to have GAMT deficiency added to the RUSP. As Kim Tuminello, Director of Advocacy and former President for Association for Creatine Deficiencies (a ThinkGenetic Advocacy Partner) said, “GAMT is exactly the type of treatable diagnosis that RUSP is looking for! All of us here today have had many physicians who have said ‘this should be a slam dunk / a no-brainer… .’” It is at the point where the detection of just one newborn through newborn screening in the United States will go a long way to getting approval for GAMT to be on the RUSP. Not every genetic condition is appropriate for newborn screening and some may never meet the criteria for inclusion. For those conditions that are good candidates, I’d like to offer a huge “Thank you!” and virtual support for the super-advocates gathering the evidence to support adding these conditions to the RUSP. I applaud their dedication, collaboration, and hard work. Hopefully this story opens one small window into the world of some of the unsung hero-advocates of genetics: the army of those gathering the data needed to help decrease the time to diagnosis and treatment of life-changing genetic conditions in our babies across the country. Thank you for writing such a great piece and shedding some light on the history of that little prick of the heel! Important article! Thanks, Dawn, for this article and all you do. Check out the work we are doing to discuss a whole range of issues and opportunities in newborn screening including the current requirement for a viable therapy, ethics/access and discussions about the role of genomic sequencing in NBS here: http://NewbornScreening.us.